Scarves are an accessory that almost everyone has in their closet but mostly has one use. Your scarf can be used for more than a mere head covering. If the only thing that comes to mind when you hear the word “scarf,” is tying it around your head,then you’re missing out on lots of other chic ways to wear this piece of versatile clothing. Fashion has no rules so why not do things out of the ordinary?Heads will turn when your scarf’s somewhere else besides its usual spot! And you may be inspiring people to try out your style! If you’ve got a nice wide scarf, rather than bunching it up around your neck, show it off as a stylish shawl. No matter the weather, you’re bound to catch a chill sometime, so a fashionable shawl is the perfect way to still show off your look while staying comfortable. Plus, when you’ve warmed up, simply drape the scarf over your arms or tuck it away in your bag; you can’t do that with a jacket! A colorful shawl/scarf pairs well with that little black dress to add some flair and fun. Or, use a basic pattern or a mono-tone scarf as a shawl with an already busy outfit. You’ll be draped in delight for a look that’s useful and glam day or night! Use a lightweight scarf as a tie-around top that looks like a million bucks. This style can be casual or fancy depending on the occasion, the scarf pattern and material, and what you pair it with. Simply wrap the scarf around the top of your torso and keep wrapping the loose ends ’round and ’round until you hit your waist. Then tie the ends in a knot or tuck under in the back. Secure with a safety pin if you fear the scarf will come loose, but with a tight wrap, this shouldn’t be necessary. Show off those bare shoulders with a choker or chunky necklace. Your top will be one-of-a-kind because it’s your very own creation! Use a thin scarf as a beautiful belt that will not only keep your pants up, but will add a pop of color and uniqueness to any look. Loop the scarf through the belt buckles and tie at the waist or on your hip. You can also break up a long dress by tying the scarf around your waist and letting the ends hang to show off the print or pattern. 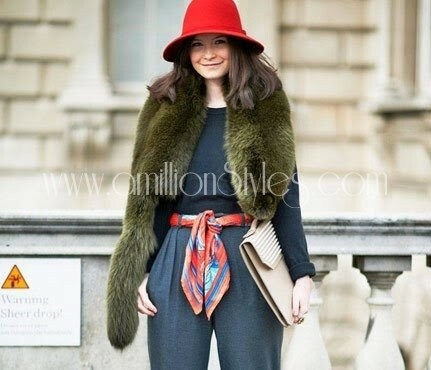 Not only is this look super-cute, but the soft material of a scarf is so much more comfortable than a traditional belt. Headwrap: On those days when your hair is just not cooperating or is taking too long to look presentable, a head wrap can be used to cover up the hair and you’ll still appear chic. Tie on the bag: Your ordinary bag can be transformed by just tying a silky scarf to one of the corners of the bag or the handle.